Compressed Air Best Practices® Magazine interviewed Michael Jones, Corporate Energy Team Leader, from Intertape Polymer Group (IPG). Congratulations on being named a 2014 ENERGY STAR Partner of the Year by the U.S. Environmental Protection Agency! Why was this award received? Reducing absolute energy use by nearly three percent over 2012. IPG’s energy program has reduced energy intensity by 22 percent and saved the company nearly $2 million on energy costs since launching in 2009. Meeting EPA’s ENERGY STAR Challenge for Industry at 8 of its 10 manufacturing plants, with an average energy intensity reduction of 19 percent. The reductions have cut CO2 emissions at IPG’s plants by 26,000 metric tons in two years. Helping EPA partner with a local utility to pilot a training approach that will help small and medium-sized manufacturers establish effective energy management programs. Establishing a local energy manager network in Danville, Virginia, to advance energy efficiency at local companies and to promote ENERGY STAR tools and resources. Mike Jones, Doug Nalette, ENERGY STAR representative, and David Bennett from Intertape Polymer Group. How has the ENERGY STAR Program assisted your efforts? We joined as an industrial partner in 2009. The first tool we used was the ENERGY STAR Guidelines for Energy Management. This guide lays out, step-by-step, the format for developing an energy management program. It starts with making a commitment (from the top-down), assessing where you are, setting goals, making and implementing a plan, evaluating results, and so on. We used this plan as it was laid out. Another tool important to our program is the Energy Management Program Assessment matrix. This matrix looks at your energy management program, at a high level, and grades you against the steps laid out in the Guidelines. The matrix is very effective because it allows you to track how your energy management program is progressing and being implemented. Another tool that Intertape used is the Facility Assessment Matrix. This has been very important to our program. It’s designed for the plants; we required each plant to complete this matrix. We developed an Excel spreadsheet, with a grading criteria for each plant, to use to report according to the matrix. This became our scorecard. We have an annual Energy Summit where we bring each Energy Coordinator in to review the scorecard. It’s a red/yellow/green scorecard allowing us to quickly see where we need to improve across the board and what certain plants need help with. This is one of the most important tools we’ve used to improve. We track them year after year to see if a plant continues to improve. Those are the most important tools. We’ve also used networking meetings held each month, the posters, and the ENERGY STAR Challenge for Industry. If you show a reduction in energy intensity, you get recognized for it. Several plants have achieved this and it gives a great boost for the energy program at the plant and corporate level. How has a formal energy management changed things? Before ENERGY STAR, we were a bunch of engineers getting together and talking about projects we’d done to save energy. We needed something to take us to the next level. We believe ENERGY STAR has done that. The thing I like about it is the tools are easy to use and they focus on building a culture around energy efficiency. It focuses on delivering higher-level tools. Every time a plant wins an ENERGY STAR Challenge for Industry, we do a press release and our CEO will recognize the plant and the individuals involved in a quarterly video. The networking opportunities are tremendous. ENERGY STAR holds an annual conference which we attend every year and where we meet many energy professionals willing to freely share information. We heard about the Energy Treasure Hunts while talking to energy managers at this conference. We are now conducting Energy Treasure Hunts to find new low or no-cost energy conservation projects. We just got done conducting an Energy Treasure Hunt identifying a lot of compressed air opportunities at our Danville, Virginia facility. I guess you know the compressed air system at the Danville plant pretty well!? I better. In addition to my energy management responsibilities, I’m also the Manager of Engineering in the Danville plant. If a plant uses a lot of compressed air, it’s a great treasure hunt opportunity. We use a lot of compressed air to move raw materials. In our Treasure Hunt, we found significant volumes of compressed air were being used, by operators, to move our lightweight plastic materials (we call it fluff in the plant) that’s gotten hung up on some fabric or ductwork. We have a lot of static in the environment and it can cause materials to get hung up or cling to equipment. The fix here might be static elimination or it might be modifying equipment to widen the flow area, with a bigger conveyor or pipe, to reduce ways our lightweight plastic materials can get hung up on things – and eliminate the need for compressed air to do it. How is energy management structured at IPG? Our CEO is interested in energy management and highly involved. Our Senior Vice President of Operations, Doug Nalette manages all manufacturing and directly supports the Energy Program. We have David Bennett, who is the Director of Operations, and he is the Sponsor of the Corporate Energy Team. I am the Corporate Energy Team Leader. Each plant has an Energy Coordinator who is part of the corporate energy team. We have monthly meetings and an annual energy summit. Each plant has a energy team where they work on projects for the plant. The operations managers have weekly conference calls, and I participate once a month to provide updates on the energy team. Energy Coordinators are typically plant engineers, electrical engineers or maintenance managers. We target people who can get things done in a plant. We need people who can run and manage several projects and a team working on them. They must be pretty capable technical people. It helps, for example, if they have the resources available to fix compressed air leaks! It also helps if they have the resources to call up a vendor to ask for an audit. How does IPG communicate the results of the energy management program? We have a report each plant completes each month. The report format takes the energy bill and it automatically calculates energy intensity. This means how much the plant produced per kWh. 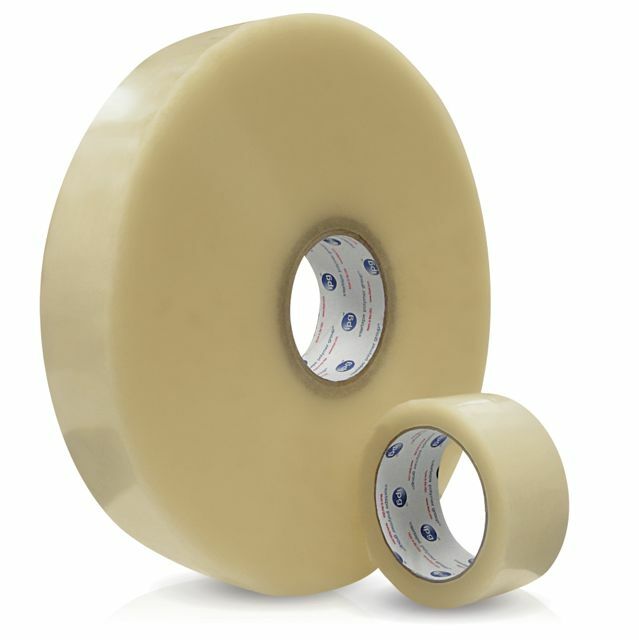 We use, for example, BTU’s per square meter of tape. We also make stretch film so we have to convert pounds to square meters. At the Danville facility, we’ve just implemented an energy monitoring system with a dashboard and our electric, gas, and water meters are tied into this. It will allow us to see where everything goes on a real-time basis. We hope to roll this out to each plant. We think each plant has a good feel for where energy goes but we think this will help us get a specific number. What kind of work have you done optimizing compressed air systems in your plants? No plant is the same, but the average tape plant has plastic extruder motors and electric heated dyes as the largest energy consumers. Other consumers are chilled water (20%), compressed air (3%) and lighting (1%). As a company, we do focus on compressed air energy consumption. It’s an area that can get out of hand if you don’t keep an eye on it. We’ve installed a couple of demand expanders (with storage tanks) to try to minimize the variation in compressed air volumes sent to the factory floor. This has allowed us to reduce plant pressure in the plant. We used to run 120 psig and now we run in the low 90’s. We’ve had compressed air studies done in several plants where companies like Lewis Systems conducted an air audit and made recommendations, including changing piping and putting in some variable speed drive rotary screw air compressors. We’ve seen energy reductions result from these studies. We’ve done several compressed air leak treasure hunts where we have a team identifying leaks and a team right behind them fixing the leaks. In the past, we had done compressed air leak audits identifying a ton of leaks - and then the person fixing them couldn’t find the leaks. Identifying and fixing leaks simultaneously works well. Now we pretty much schedule these treasure hunts when we have a period in the summer and winter when we have a shutdown. We have a team ready to go with an ultrasonic meter and a red tag system where you put a special tag on the leak and document it. The list is given to the team working behind them, they fix it, and then remove the tag. Last year, we estimate our compressed air leak team saved 35 horsepower in air compressor power in the Danville plant, and other plants do the same thing. Each plant has ultrasonic equipment for finding compressed air leaks. How did you get involved with the energy management program at Intertape? As the years have gone by, my role has shifted towards the energy management program as it has grown. I’ve been with the company eight years. We started the program with two plants and as time went by we got more people and plants involved. We started small and tried to share best practices and it’s really grown. ENERGY STAR has shown us how world class energy management gets done. My role has expanded as the program expands. What kind of energy management work do you do with the chillers? We work quite a lot on the required maintenance on chillers. We use a contractor for the normal preventative maintenance. We look at chiller set-points and try to maximize them for energy efficiency. If you can increase the set-point a couple of degrees, it can make a big difference. At our Danville plant, we have a capacity of 5,000 tons of cooling managed by over fifteen chillers. What are some next-steps for your program? We have a Sustainability Team that I sit on, as the energy management program falls under this umbrella at IPG. As we move more towards focusing on Sustainability, the energy program will work more closely with this. The next steps for our program are to continue to improve using ENERGY STAR tools and the matrix in areas where we might have gaps or need improvement. We can broaden the scope of communications to involve marketing and sales and branch it out even more across the corporation. I see it moving into a bigger focus on sustainability, not just energy, by focusing on recycling and improving the environment as a whole. We will widen the net by moving from the industrial plants into our warehousing and office buildings facilities. Thank you for your insights and congratulations for Intertape being named a 2014 ENERGY STAR® Partner of the Year.